This show includes some recent sculptures and photographic pieces by an artist who has consistently made the pathologies of racism his subject. And he has been particularly astute in examining the workings of what W. E. B. Du Bois called double consciousness, the condition in which people see themselves reflected, often negatively, in the view of others and end up molding their lives to confirm that view. 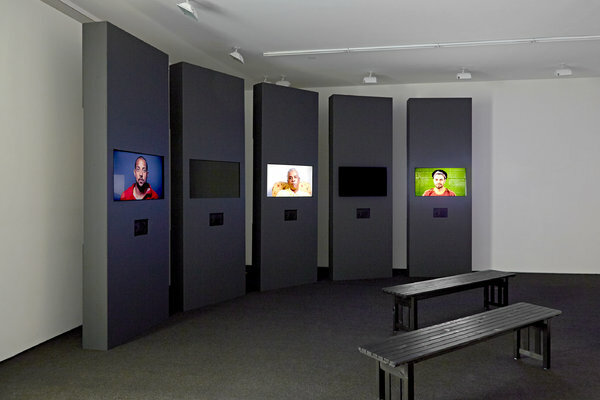 The phenomenon is repeatedly addressed in the show’s most significant piece, the five-channel video installation “Question Bridge: Black Males,” made up of deftly edited and interwoven interviews with some 150 African-American men. Students, retirees, businessmen, teachers, prison inmates and artists, the speakers grapple, optimistically and pessimistically, with questions about why racism in America exists, whether it can be changed and, whether it can or can’t, how they can change themselves. There are wonderful voices and a lot of wisdom this project, which was created by Mr. Thomas and three collaborators, Chris Johnson, Bayeté Ross Smith and Kamal Sinclair. It is currently showing in museums, galleries and schools across the country and is a work in progress. An interactive online version, questionbridge.com, is scheduled to appear in January; whoever signs up can contribute an interview, join the conversation. The semi-wraparound gallery presentation is a more passive experience. But the material is so compelling, and so much of the moment, that you feel pulled in and part of what’s going on.